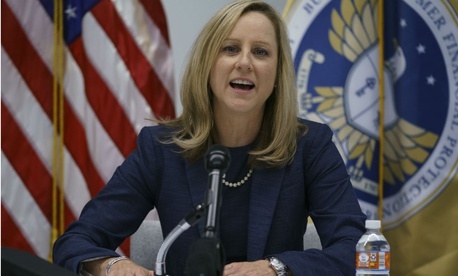 On her first day as the permanent director of the Consumer Financial Protection Bureau, Kathy Kraninger said her talks with staff and stakeholders show that many are glad that certain decisions were slow-walked by her acting predecessor—President Trump’s budget director Mick Mulvaney. Though Mulvaney, with whom she worked for nearly two years at the Office of Management and Budget, “was a fantastic boss,” he came part-time to the CFPB “under different circumstances, with a new administration and challenging dynamics, which is a different posture than coming in full-time with a five-year term,” she said. She will be “fully accountable, and the decisions are mine,” she said in a session in the bureau’s conference room. Kraninger, a homeland security specialist at OMB who narrowly cleared the Senate last week in a 50-49 vote, said her priorities will be determined after a three-month “listening tour” of the bureau’s field offices. They include sites in San Francisco, Chicago and New York (the Southeast office, currently in Washington, D.C., will move to Atlanta, she noted.) It’s important to “meet with state regulators, other federal regulators and consumer advocates,” she added. One area of focus, she predicted, will be “data security and data privacy—what is collected, how it is used, and what information is appropriately shared,” she said. “I have a lot of interest in the resources of the agency and how important it is that they be well utilized” by the bureau’s 1,500 employees in six divisions. Kraninger said she hoped to schedule a meeting with Rep. Maxine Waters, D-Calif., a fierce critic of Mulvaney’s approach who is slated to chair the House Financial Services Committee in January. “We want a productive relationship with Congress, a critical stakeholder, and will do the utmost at the agency to be transparent and accountable,” Kraninger said.